Returning to the world of Paddington is like returning to a reliable, comforting old friend. From the opening which is dramatic, sincere, sweet but funny, you understand exactly what this film is going to be: a development of the first and nothing less. There is nothing wrong with that though because the first Paddington was such a good film that having another story with this delightfully sweet bear is always welcome and couldn’t come soon enough. After the aforementioned opening which delves into Paddington’s roots we get the set-up for the movie; a present for Aunt Lucy. The movie solely relies and revolves around a rare book and the trouble it causes as Paddington attempts to raise money to buy it. That in itself is perfectly simple as there doesn’t need to be anything complicated for Paddington to work – just a simple set-up for his comedy pieces to revolve around. It begins strongly and with the best of what Paddington delivers as a character: slapstick. 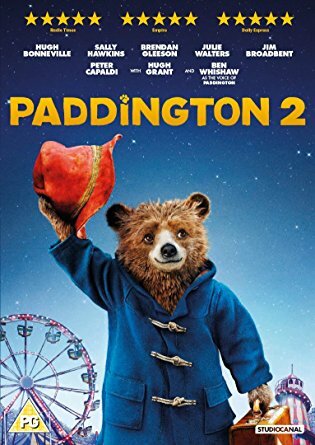 Paddington gets jobs to try to raise money to pay for the book and in doing these jobs he gets himself into the messes and ever escalating situations which offered so much comedy in the first film. It is hilarious watching Paddington become a barber or a window cleaner with so little success but earnest and innocent attempts to keep things running smoothly. It is a wonder then that the film is so easily stolen from the CGI bear. Like Nicole Kidman in the first, Paddington has a dastardly villain to go up against and this time it is Hugh Grant. Playing on his national treasure status, Grant is clear with what this role requires and plays it perfectly. He doesn’t take himself too seriously and in fact gets very much involved, with costumes ranging from a knight, a nun and a ridiculous dog outfit. He is very nasty but not threatening, which is the perfect balance for a film set in such an idyllic world. Which is why a huge chunk of the movie doesn’t quite work as effectively as you’d hope. A series of bizarre events leads Paddington into prison. The film then becomes about his effects on the prison population, from staining the prison uniform pink or introducing marmalade to the masses. Some of this is very funny and works very well but it also restricts what Paddington does best. It sets him too tight a plot leash when it is best to place the small bear in as many situations for him to “mess-up” as possible. The movie’s focus also tightly restricts to the prison which means The Browns from the first film don’t get enough to do. They are all present and correct but when you have talent like Sally Hawkins, Hugh Bonneville and the always stellar Julie Walters, this feels like a crime. There are other great additions to the ever-growing support. Brendan Gleeson is great as Knuckles and there are plenty of other familiar, British faces which help keep the movie going but these don’t do enough to keep the film as funny as you’d hope it could be. Luckily, it never loses it’s heart and Paddington in prison does pull at the heartstrings, even when the prison is one which doesn’t seem that bad really. Overall, Paddington 2 is a welcome return for the lovable bear. It has some great comedy and a lovely story which has you pulling for the marmalade loving character once again. Unfortunately aspects of the story and plot are slightly restrictive and don’t offer Paddington enough space to really reach his slapstick, comedy potential.